Fawn Over Baby: The Liebster Award Nominated! 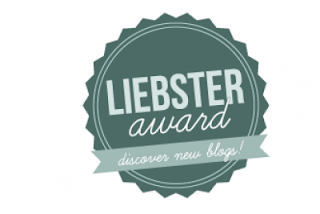 Last week I was nominated for the Liebster Award by Shawnna from Small Talk Mama. You wouldn't believe how excited I was to know that there are others out there, besides just me, that are visiting Fawn Over Baby. The Liebster award is a fun award among the blogger community that is passed around from blogger to blogger letting them know that they are recognized and loved. The word Liebster is German and means dearest or lovely. The award is given to newer blogs with 200 or less actual followers and provides a nice way for fellow bloggers to meet and publicize their site to the general public. If you would like to know more just give it a Google. While it isn't an actual award, it is still so nice to be recognized. So here are the rules that apply when accepting the Liebster Award! Where is your favorite place to curl up with a book? My little corner of the couch where the cushion is a slightly sunken in more than the rest of the couch. If you could go to lunch with three famous people, who would they be? Easy! Jennifer Anniston, Jennifer Anniston and Jennifer Anniston! What is your favorite Restaurant? Anything Mexican, I couldn't live without it! What is the best Zoo you have ever visited? I have to say The Alaska Zoo, I don't recall my last trip to the zoo anywhere else. What is the first thing you would do if you won the lottery? I would pay off my house! What is the strangest pet you've ever owned? Well, my little sister had a ferret that we all helped take care of. I am a believer in prayer and The Bible. "If you can? All things are possible to him who believes" Mark 9:23. I call my mom at least twice a day almost every day! Where were you born and where do you currently live now? If you could have a celebrity best friend, who would it be? Where is your "Go-to" place to shop online? I hope you enjoyed learning about me and if you would like to keep up with what inspires me these days, feel free to "like" Fawn Over Baby Fan Page and/or follow via Google + and/or Pinterest. I would also like to invite you to visit the blogs I have nominated and follow them as well. I love your blog! I think it's so adorable and fun! Oh, wow! I was just catching up on your blog from the busy weekend and found this. How incredibly sweet. <3 Thank you! I accept! I can't wait to answer the questions! And congratulations on your award! :) You deserve it. I hope so many readers stumble across this because of it. Your blog is a great read! Congratulations! I am a new follower from the collective blog hop. My parents were from Arkansas also, and I graduated from the U of A. It's always fun to meet a girl with southern roots. I can't wait to read your nominated blogs.